We appreciate your recent order for our PEMF8000 device! Our Pulsed Energy Technologies team is committed to leading the way within the worldwide pain management category, by developing PEMF (Pulsed Electro Magnetic Field) Therapy products that use non invasive, drug free methods of creating muscle stimulation, mild therapeutic heat, and long-term pain relief, that helps users return to a normal, active lifestyle. We are pleased to mention that your purchase also includes a 30-day money back guarantee and a 3-year unlimited Guarantee should a problem arise. If you have any questions about our equipment or service, we invite you to call us immediately at 203-389-1234, and we will be happy to assist you. Let me take this opportunity to thank you for choosing PEMF8000 device to provide your company with the finest technology and customer servicing. We are proud to welcome satisfied consumers and look forward to many years of working together. The beauty of the PEMF8000 is how easy it is to use. Anybody can work the 8000with simple training. The results are inspiring. Save thousands by the PEMF8000 being in your health. IMPORTANT: Read Me Before Powering On Your PEMF8000 Machine! Select a treatment accessory. On the accessory, you will find two cables with connector plugs on the end. Insert each plug into the matching adapters on the front panel of the PEMF8000 machine. Once inserted, twist gently to the right to lock the plug into place. You will feel a gentle click when the plug enters the locked position. Do NOT power on the machine until your treatment accessory is connected in this way. Plug the machine into a 110V 50/60 cycles outlet. Avoid plugging it into outlets that are connected to a light dimmer. Flip the Power Switch on the bottom of the front panel. It will light up green. You will hear fans turn on inside the machine. The Stop button on the front panel will light up red. Set how long the session should last. Turn the radial dial on the Timer anywhere from 1 to 30 minutes. When the timer reaches the time you set, the session will end. Press the Start button to start the session. The Start button is located directly above the red Stop button. When the session starts, the Start button will light up green and the Stop button will go dark. You will hear the machine make a rhythmic popping sound. As long as this popping continues, the treatment is in session. To stop the treatment before the timer runs out, press the Stop button. It will light up red and the popping sound will stop. Sometimes, one extra pop may go even after the button has been pressed. This is normal and safe discharge of unused energy in the machine from the session. If you press the Start button again, the timer will start over from the beginning for a fresh session. After the timer runs out or the Stop button is pressed, you may power down the machine. Flip the green Power Switch to the off position to turn off the machine. Do NOT flip this switch while treatment is in session. When the Power Switch is in the off position and the machine is fully powered down, you may remove the accessory plugs from the adapters in the front panel. Also to remove the plugs from the device, pull back on the silver locks with your thumb, twist the plug to the left, and gently pull back to remove the plug from the adapter. Do NOT remove the treatment accessory while the machine is powered on. 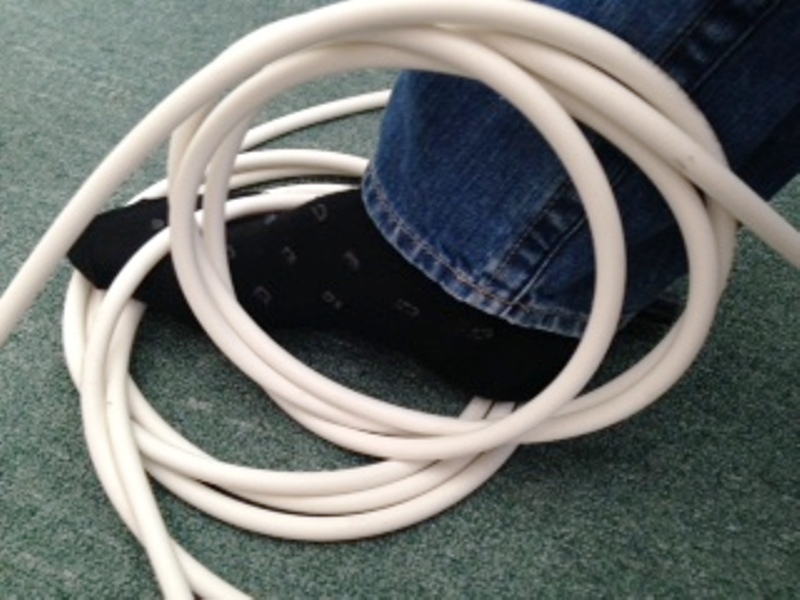 Loop – Simply hold the treatment rope up to the area to be treated. This is best for sensitive areas such as the eyes, mouth, neck and other areas near the head. Loop coil – Arrange the rope into a coiled loop. 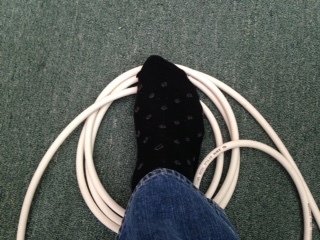 Hold the center of the coil up to the body part to be treated from multiple angles for best results. Experiment by holding the loop at different distances from the body to find the ideal comfort level. Identify the Source of Pain – Locate the source of pain in your or your patient’s body. Touch it if possible to get a sense of its size, shape and exact location. If the pain is all over, try to identify where it is the strongest or the most swollen. This is where the treatment will begin. Rate the Pain on a Scale of 0 (No Pain) to 10 (Extreme Pain) – This will give you a good gauge from which to measure your results immediately after treatment and over the next week as you monitor your progress. If you will be treating regularly it may prove useful to write this number down before the Session and again after the Session for future reference. Prepare the Rope – Take the treatment rope (or other accessories) and plug each end of the cable into the top slots on the front panel of the unit. After inserting, secure each plug by gently twisting it clockwise until it clicks into place. To remove the cables after powering down the unit, pull the silver locks back with your thumb and twist the plug counter-clockwise. Power the Device On – Plug the power cord into the wall (or specific adapter). You will see a Power Switch at the bottom of the front panel. When it is flipped into the ON position it will light up green. Do not switch it on until the treatment accessory is attached. Set the Timer – Each machine ships with the option to treat for up to 30 minutes. If you turn the timer up all the way, it will pulse continuously without running out. The timer dial does not move by itself. The end of the treatment will be marked by the green Start button dimming and the red Stop button lighting up. Average treatment duration is 1 to 5 minutes. Start and Stop Buttons – You will see two buttons next to the timer. When you turn on the unit, the Stop button lights up red and the Start button stays dark. Press the Start button to begin the session and it will light up green. Push the Start button again before the session times out to start a new session of the same duration. Push the Stop button to end the session before the timer runs out. Always stop the session before powering off the device. Apply the Rope to the Treatment Area – Place the rope coiled with your chosen method on or near the body so that it surrounds the source of pain identified in Step A. Start by holding the rope far from the body. After you press the start button in Step H, you can slowly bring it closer to the body until it touches or until each pulse is felt comfortably. Start the Session – Press the Start button. You will hear a popping sound come through the machine each pulse. Each pulse may produce a slight muscle contraction and tingling sensation. The strength of the contraction depends on the number of wraps made on the treatment rope, distance of the rope from your body, the size of the loop, the Intensity adjustment on the front panel, and the muscle groups exposed. If you do not experience muscle contractions that is fine because you are still receiving treatment. Adjust the Intensity and Rep. Rate – There are two knobs on the front panel. One controls the Intensity, which is the strength of each pulse. And the other controls the Repetition Rate, or speed of each pulse. Turn the Rep Rate all the way up and focus on adjusting the Intensity. Adjust the Intensity until the treatment is felt strongly but kept within the range of the user’s comfort level. As the Intensity is turned up, the Rep Rate will automatically slow down. We strongly recommend that you leave the Rep Rate dial set to maximum and only adjust the Intensity Dial. On ‘Extra Pulses’ After the Session Ends – Sometimes after the timer runs out the machine will make an additional pulse. The machine is discharging unused energy built up during the session. This is normal and happens occasionally. After stopping a session, wait a moment to be sure that any additional energy has safely discharged before powering the machine down and removing the treatment accessory. (1) Precautions – Do not use if you are using a pacemaker, insulin pump or other internally implanted electronics whose function may be influenced by dynamic magnetic fields and induced electrical current. Also, do not use this product in the brain. We do not recommend the use of this machine on the brain for any reason. (2) Make Sure the Treatment Rope is Intact – Inspect the rope before use to make sure the insulation (ie: white part of the rope) is not torn, damaged or severed such that the wire inside is exposed. If the insulation is broken, STOP! Do not use that rope. Use a different accessory or visit our website to order a replacement. (3) Avoid Using Outlets Controlled by a Light Dimmer – The magnetic field generated by the PEMF 8000 causes small electronics like that inside of light dimmer to malfunction. It will create a surge of electricity that can damage either your PEMF unit or the light dimmer attached to the outlet. Make sure the outlet you use is not controlled by a light dimmer before you power the unit on! (4) Give the Fans Room to Breathe – If the fans are blocked or stopped this may cause internal damage to your PEMF 8000. Always make sure nothing can stop or slow the airflow from the fans while the unit is powered on. Also ensure that no dust and debris can be sucked up by the fan. (5) Power Down Before Changing Accessories – Stop the session and power the unit down before swapping accessories. Make sure the cables snap securely into the connectors before powering on again. 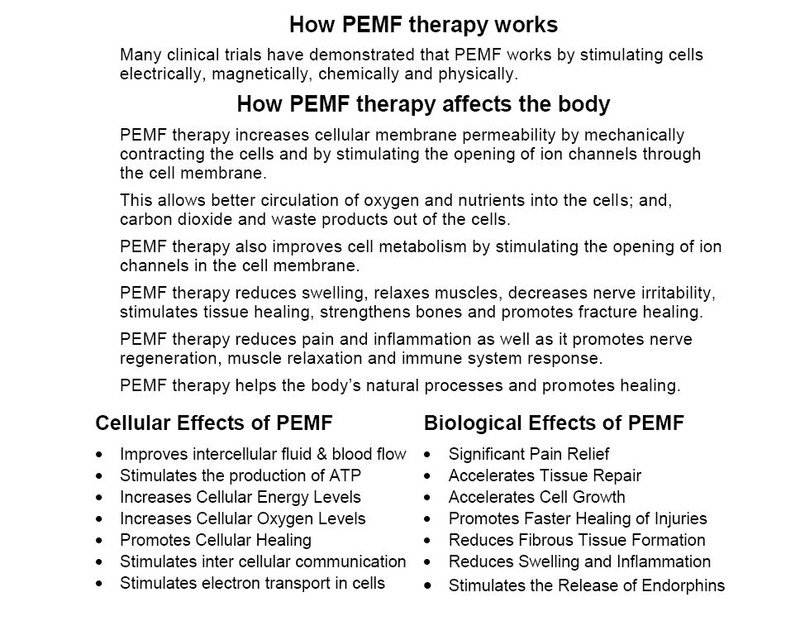 (6) Dealing with “Cleansing Crisis” – The PEMF 8000 stimulates cell metabolism functions. These functions include releasing toxins to be removed by your immune system. Cleansing crisis happens when the immune system becomes overloaded by detoxifying the body too fast. To help the body flush the toxins, drink a large glass of water after each treatment. (7) Always Use the Handles on the Case to Move the Unit – The strain from pulling on the Treatment Rope connectors or the power cord will damage your device. 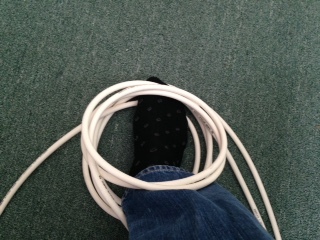 Tugging may also damage the wires. Always use the suitcase handles or roll it on its wheels to move, adjust, swivel and transport your unit. (8) Do Not Drop or Toss the Unit – While the case is durable, remember it mainly lends external protection to the sensitive electronics inside. Dropping and tossing the unit may cause internal damage. Always put the unit down with care. And make sure the unit is fastened securely and padded for minimal movement during travel. (9) Storing Treatment Accessories – Avoid storing the rope or other accessories inside of the suitcase of the machine where it can press down on the front panel and damage it. Store accessories separately. (10) Do not expose to water – Do not allow the unit to get wet. If it does, dry it as best you can. If the water gets inside of the machine, wait overnight for it to dry out. Do NOT power it on during this time. If you receive your unit and find the front panel is wet with dew from changing temperatures during shipping, make sure to dry it well especially around the accessory connectors and wait overnight for it to dry internally before powering up. Every device includes a 3 Year Warranty. The warranty is the period of time during which we accept units for repair or replacement without additional charge. This Warranty is subject to conditions. Machines returned to us that we find to be damaged beyond repair, shows evidence of extreme usage, intentionally damaged (ie: abused), serviced or opened by anyone other than a technician approved by PEMF WELLNESS TECHNOLOGY, or revealing a security breach due to tampering, a fee may be applied or service may be refused. We reserve the right to deny service for the above and for any reason. Like PEMF 8000? Help Us Spread the Word! 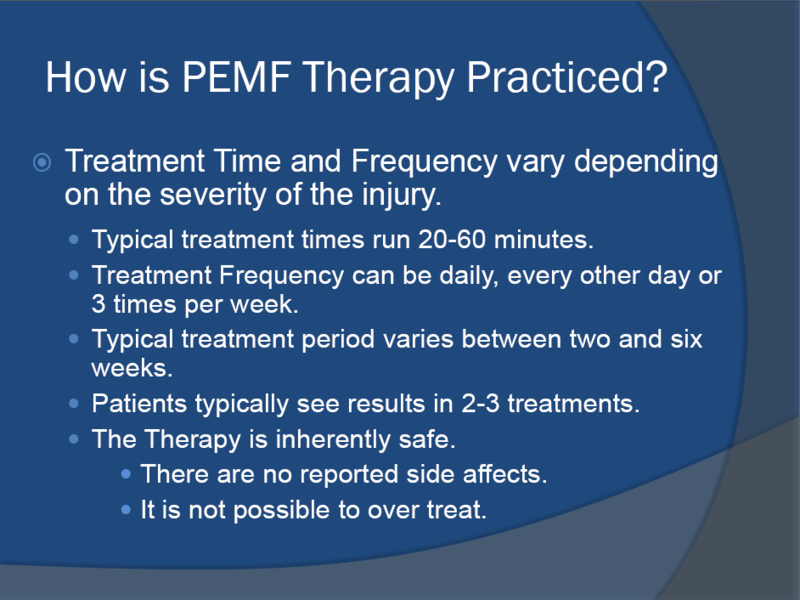 Did you know that thousands of people in every country of the world struggle with chronic pain and permanent injury conditions but do not have access to therapy with PEMF 8000? If PEMF8000 made a positive difference in your life, you can help us to help others who are still searching for a solution! We understand that 80% of people who purchase the PEMF8000 only intend to use it for themselves, their families, or at their own clinic. That’s why this message is for the 10% of people who would go out of their way to show others who are struggling like they were just what they are missing, and the 10% of doctors who would share with their peers the stunning results they learned were possible for even their worst patients. Our goal is to make PEMF 8000 available to neighborhood doctors, chiropractor, and clinics around the world because they are the first line of defense people turn to for chronic pain management. We need your help to reach them! There are a couple of things you can do to help us get the word out and we’ve listed them below. If you take just one of these actions, you can feel good knowing that there is a person somewhere in the world who is no longer living in unmanageable pain, thanks to your help! With your help, we can make PEMF8000 the first line of defense against chronic pain and permanent injury conditions for doctors and clinics the world over. Together, we can put chronic pain on the ice. Thanks from the whole team for reading and helping us heal the world! 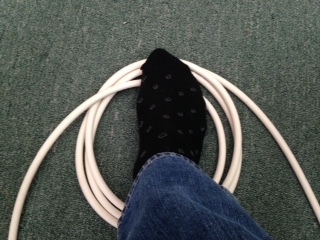 There are several unique protocols to use with the healing PEMF rope. This is a basic way to use the rope! 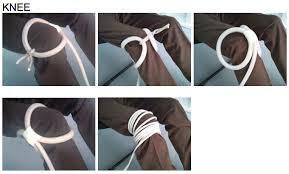 There are many more advanced ways to heal with the rope and are shown below! WRAP THE ROPE AND LOOP LAID ON THESE AREAS 3 MINUTES EACH POSITION TO HEAL PAIN AND CREATE WELLNESS WITH PAIN AND HEALING! 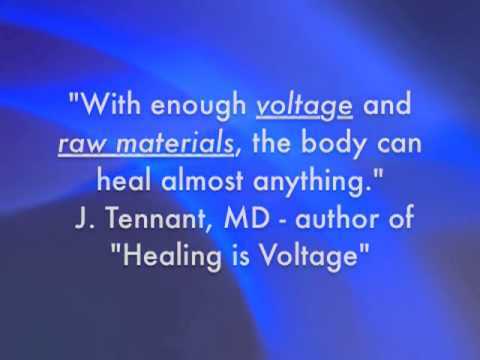 PEMF8000 helps to repair every disease known to man! We have dedicated clients that are Doctors, chiropractor, Physical Therapy, Hospitals, Clinics, and Pain Centers and also include many Alternative Medicine consumers as well. Below I incorporated for you an abundance of info and links on PEMF Theory and Therapy and more. I have had many years of experience in the ELT Field, and have also successfully instructed and trained PEMF clients and Technicians through-out the world. You are welcomed to call me Anytime!. Allow me prove how our Device can help you today! Charlie (203) 214-5454 I’m in Connecticut!